I hope everyone is not as frozen as we are! It looks beautiful outside but quite scary to drive/walk on....we have to be very careful but I guess that's all a part of winter right?! The sad part....it's not OFFICIALLY winter yet so I'm thinking we're in for a rough season!!! My card is featuring the sketch and color challenges from SCS. I had a lot of fun putting it together especially experimenting with this color combo since it's not something I would normally use but hey, that's why they're called challenges!!! Enjoy the rest of your Saturday and stay warm if you're in wintery places. Thanks so much for stopping by!! Wow Jackie this looks great. You sure know your way around challenges. Keep them coming. Jackie, this is super cute, I love that set. You have done a great job with it!!! Stay warm my friend! beautiful!! love this color combo!! Lovely colours and Card! Again! Ooooh, this is lovely! 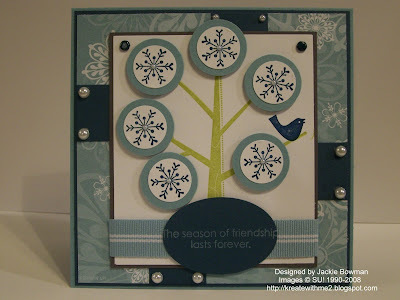 Love the idea of a snowflake tree! Wish we could have snow. Snow and ice stop being fun when the power goes out so I will keep my fingers crossed that everything stays on. You did a great job with both of the SCS sketches. Fabulous card, i like the colors. We have snow here. Luckily the ice only put a little topping on the snow. The main roads are all clear. Not looking foward to those cold temps they're expecting here tomorrow (high of 9) YIKES! This card is gorgeous. Love the colors and I think that's one of SCS's better layouts, too! Be well, be safe & be happy. Beautiful card Jackie and great combination of the challenges! Love the dp and the pearls! Jackie- I love this card! Jackie, this is incredible! I'm having a blast viewing some of your older creations.